Porter Ranch, CA — Methane gas continues spewing, unchecked, into the air over southern California from a fractured well to an underground storage site — at such an alarming rate that low-flying planes have necessarily been diverted by the FAA, lest internal combustion engines meet highly volatile gas and, well, blow the entire area to hell. Claire Bernish joined Anti-Media as an independent journalist in May of 2015. Her topics of interest include thwarting war propaganda through education, the refugee crisis & related issues, 1st Amendment concerns, ending police brutality, and general government & corporate accountability. Born in North Carolina, she now lives in Cincinnati, Ohio. This article (Unstoppable California Gas Leak Being Called Worst Catastrophe Since BP Spill) is free and open source. You have permission to republish this article under a Creative Commons license with attribution to Claire Bernish and theAntiMedia.org. 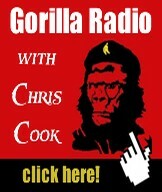 Anti-Media Radio airs weeknights at 11pm Eastern/8pm Pacific. Image credit: Tim Evanson. If you spot a typo, email edits@theantimedia.org. I confess to not watching the entire presidential ‘debate’. By 20 minutes, I could stand no more. I saw nothing more than a pack of dogs, yelping fear, hatred, ignorance and enmity at the world around them. It was as astonishing as it was ugly. There were no words; there were merely snarls at a world that dared outgrow them, that no longer regarded them as the moneyed masters of the universe. With few exceptions, they paid tribute to the ignorance that birthed the disaster in Iraq, or that nursed their CIA, MI-5, ISI, and Saudi-trained and paid assassins now nipping at their heels. They growled at immigrants, even though all of them, save one, were sons or grandson (or granddaughter) or immigrants. That one? Hounds may bay at the moon, but they can’t move it an inch. Dogs may chase a bus, but they can’t really catch one. These dogs of war may open the door to carnage, but it will be your sons and daughters who suffer and die on the bloodied altar of political ambition. They will bury their charred remains, grant them a medal, and step over their shredded bodies in pursuit of vain political advantage. This war, started in imperial hubris, will wage until our grandchildren are elderly – no matter what. And these politicians will bay at the moon, with more murder on their minds. California's Deep Water Horizon: Aliso Canyon Methane Gas Leak Disaster "Unstoppable"
"the enormity of the Aliso Canyon gas leak cannot be overstated." Gas is escaping through a ruptured pipe more than 8,000 feet underground, and "it shows no signs of stopping," according to the California Air Resources Board. 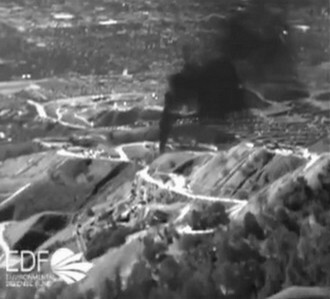 Methane - a greenhouse gas 72 times more impactful in the atmosphere than carbon dioxide - has been escaping from the Aliso Canyon site with force equivalent “to a volcanic eruption” for about two months now. New infrared footage exposes the massive leak. Though methane, itself, has no odor, the addition of odorants methyl mercaptan and tetrahydrothiophene — a safety measure to alert people by smell to the presence of natural gas — has made the enormous methane seepage impossible to ignore. Thousands of households have evacuated the area, despite little help, much less information, from the gas company about when they might be able to return. As reported by the Los Angeles Times, SoCalGas spokesperson Michael Mizrahi claimed the company had paid to relocate and house 2,092 households — but that effort is severely lacking, says Los Angeles City Attorney Mike Feuer. Bolton is not a peacemaker, nor, in his defense, did he ever try to appear as if one. When he was appointed as the US Ambassador to the UN by George W. Bush, his stint lasted for only one year, starting August 2005. 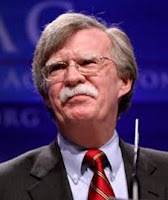 In fact, Perle is quite a cherished member of the American Enterprise Institute, where Bolton often mounts his occasional articles in mainstream US media, offering a ‘vision’ regarding how to take on Iran, how to reform Arab states and how to redraw the map of the Middle East in ways that are conducive to US foreign policy interests. The latest of such intellectual charges by Bolton was published in the New York Times on November 24. Under the title, “To Defeat ISIS, Create a Sunni State,” he theorized once more, raging against "Obama's ineffective efforts" to destroy ISIS and demanding, instead, a “clear view shared by NATO allies." The main drive behind his logic is that once ISIS is destroyed, the region that the militant group designated as a 'state' should be turned into a Sunni state, which, as a working title he called "Sunni-Stan." Kabul - Here in Kabul, young friends with the Afghan Peace Volunteers look forward to learning more about “The Tea Project” in late December, when Aaron Hughes arrives, an artist, a U.S. military veteran, and a core member of Iraq Veterans Against War. He’ll carry with him 20 plaster replicas of a standard-issue, factory-made Styrofoam cup. They’re part of a set numbering 779 replica cups, each cup dedicated to prisoners detained in Guantanamo. In the entire collection, 220 of the cups bear names of Afghan citizens imprisoned in Guantanamo. In Guantanamo, with each evening meal, Guantanamo prisoners are served tea in styrofoam cups. 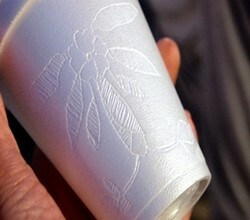 Many prisoners etch floral designs into their cups, which become a nightly artistic outlet for men with few other freedoms allowed them. Aaron had heard a former Guantanamo guard describe how deeply he grew to love the cups that had become works of art. Witness Against Torture activists from the U.S. focused on Tariq Ba Odah’s life in Guantanamo when they set up their encampment, in late November, 2015, in Cuba, outside the U.S. naval base. 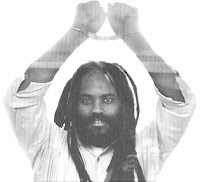 Like Aaron, they feel great empathy for the people imprisoned in Guantanamo, along with responsibility to keep educating U.S. people about the plight of 47 prisoners still held there. The delegation demanded that the prison close. They reject a new plan being developed by the Obama administration which would move the Guantanamo prisoners to prisons in the U.S., some still to be held indefinitely without charge or trial. “Simply moving Guantanamo is no solution,” says Helen Schietinger of Washington, D.C.
KATHY KELLY co-coordinates Voices for Creative Nonviolence and has worked closely with the Afghan Youth Peace Volunteers. She is the author of Other Lives, Other Dreams published by CounterPunch / AK Press. She can be reached at: Kathy@vcnv.org This article was first published on Telesur English. Spain Fallen: Que Pasa, España!? The Spanish elections – 20 December – were a deceit and a farce. Nobody seems to notice. At least not those concerned, the ignorant electorate, those who will suffer again possibly under a new neoliberal Rajoy leadership. People forget and are vulnerable to propaganda and lies and manipulations through the bought media in Europe as much as in the US. And this in Spain of all places, where unemployment is still hovering around the 20% – 25% mark, with youth unemployment around 50%, and where an average grad student coming out of university earns on average 1,000 euros or less per month, if he can find a job; hardly a livable wage. Others have to survive on monthly incomes in the 500 to 800 euro range. Spain, a country like Greece, where neoliberal troika policies cut minimum wages, pensions, increased retirement age, privatized the health system – and are at the verge of privatizing education. Spain, a country where the ruling Partido Popular (PP) was and still is involved in horrendous corruption scandals all the way to the top, as was widely divulged earlier this year even by the mainstream media. Does it not seem absurd that in this miserably down-trodden Spain, the largest single block of people are no more awake than voting again for their hangman? Maybe they are awake, but stunned of the results and are too tired from working for peanuts than ‘wasting’ their scarce spare-time to investigate election results, analysing how elections could have turned out the way they did: The arch-conservative neoliberal PP winning a majority of parliamentary seats – 123 (28.7% of votes), though a far cry from the absolute majority (176) and a drop of 64 seats from 2011; the PSOE (Socialist Party) coming in with 22% and 90 seats (down 20), its worst result ever; the up-and-coming PODEMOS – gaining 69 seats (20.7%); and the new center-right Ciudadanos Party winning 40 seats (13.9%), the latter two from basically zero in 2011. Forming a new Government with these fractured election results will not be easy. While the new Congress is normally responsible for choosing the new Prime Minister, in the present divided Spain it is likely that King Felipe will have to intervene, negotiating with the leading parties to propose a candidate that suits them all. This process starts officially on 13 January 2016, when the new deputies are sworn in and the speaker is selected. If the Monarch’s suggested candidate doesn’t get an absolute majority in the first round, there will be a second round of voting 48 hours later, where the proposed candidate must only receive a majority of the cast votes. Failing this, new elections will have to be called within two months. This would be a first in Spain’s history. 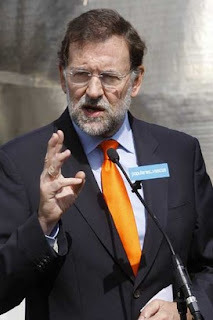 The socialists have already said they would not support the incumbent, Mariano Rajoy. But will they stick to their promise? First, how come that in the traditional two-party system, suddenly four parties emerge, three of which of almost equal strength, PP, PSOE and Podemos, and the fourth, Ciudadanos rapidly growing. Together they accumulate 322 of the 350 seats, or 85.3%. The two new ones, Podemos and Ciudadanos (also called C’s) grew from basically nothing in March 2014, some 18 month ago, to take a total of 109 parliamentary seats, almost one third of all seats. That is unheard of anywhere in the western world. This coincides with the time when in Greece Syriza started making headways. Second, how come that in a country where 80% to 90% of the population suffered misery and social hardship from the neoliberal PP-imposed austerity programs – still vote with a considerable majority for the party that punished them? Is this the Stockholm syndrome, or what? – Is there perhaps something else behind it? Spain was ruled by fascist General Francisco Franco for 39 years, from 1936 to his death in 1975. Out of the Civil War (1936-1939) grew an authoritarian, nationalistic fascist party, the Falangistas. 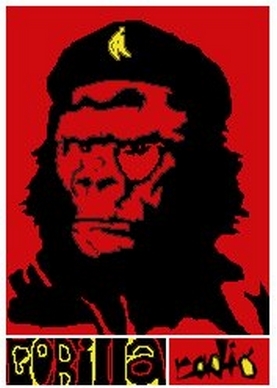 They became Franco’s official ruling party in 1939. The Falangistas were instrumental in commandeering death squads and ‘disappearances’. After WWII Spain was internationally considered a pariah state due to her fascist and oppressive government and was kept out of the UN, the Marshall Plan and NATO. Nevertheless, in 1953 Washington tempted by the peninsula’s strategic situation entered into an alliance with Franco by signing the Pact of Madrid. It was a calculated step for the US to establish military bases which guaranteed America’s support for the dictator – who was also a fierce opponent of the Soviet Union. Spain was admitted to the UN in 1955 and eventually seven years after Franco’s deaths, in 1982, Spain became the 15th NATO member. During Franco’s reign, the Falangistas solidified as a dictatorial fascist party. After Franco’s death, the party did not disintegrate; to the contrary, to this day it remains very influential with close ties to the Catholic Church. With this semi-clandestine right-wing political scenario alive and well, wouldn’t it have been relatively simple for Washington to pull the strings and creating a multi-party divided Spain, easier to manipulate and to control? Another form of divide and conquer. 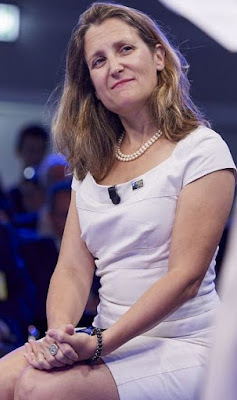 US global interests wanted to avoid the risk of another Greece, where the left would come to power and would need to be smashed as did happen with Syriza under the command of Anglo-Zionist Washington – implemented by the troika (European Central Bank, European Commission and IMF). Had it not been for most likely criminal threats to the lead-politicians of Syriza, Greece was at the point – and still is – of disintegrating and exiting the euro – and possibly also leaving the EU – the European non-Union. Another ‘Greece’, as Spain could have become, might have prompted not just a ‘Spaxit’, but most probably the collapse of the EU altogether. That would have been an unforgiveable and probably unrepairable disaster for the Unite States which needs Europe as its puppet union of states directed by Washington lackeys in Brussels, for trade and manipulating markets, as a monetary stability base and for highly qualified cheap labor; and – maybe most importantly – as a vital buffer vis-à-vis Russia and the emerging eastern alliance with China – the BRICS and SCO (Shanghai Cooperation Organization) states. For those still in doubt – the Unite States of America were the initiators and creators of the European Union, carefully planned, step by step, from the Brussels Treaty after WWII in 1948, to the Paris Treaty 1951/52, to the Modified Brussels Treaty 1954/55, to the Treaty of Rome 1957/58, and eventually to the Merger of Treaties in 1965/67 forming the three pillars of the European Community (European Atomic Energy Community (EURATOM), European Coal and Steel Community (ECSC), European Economic Community – EEC); leading to the Maastricht Treaty of 1991/92 – the foundation of the European Union, enhanced and modified by the Amsterdam Treaty, 1997/99; followed by the Nice Treaty, 2001/2003; and finally the 2007/2009 Lisbon Treaty, currently in force. You may notice the European Union has no Constitution; and none of the various Treaties foresees a political European Union, one that would have solidarity of federal nations as a fundamental basis. A 2004 attempt to establish an EU Constitution was immediately boycotted by the UK as a proxy for Washington, so as to have subsequent popular votes in France and the Netherlands fail. A Union of nations without a common political agenda and goal cannot have a sustainable common currency. That’s where the thought process may have failed. The Euro may sooner or later be doomed to collapse and so may be the European Union; the sooner the better. The prompting of the process of dissolving this fake union, of breaking loose of the nefarious fangs of Washington and NATO, will be a sign of the European populations’ awakening and wisdom. Reflecting on the Spanish elections of 20 December 2015, putting them into context with never ending austerity imposed by the rich on the poor, resulting in a never ending economic ‘crisis’ – leading to ever richer banks and an ever richer Anglo-European elite — may hopefully be a trigger for action. Tuesdays evening, Israeli settlers from the illegal settlement of Ma'ale Levona, north of Ramallah, destroyed 45 olive trees owned by Majed Daraghme from al-Leban al-Sharqiya town, south of Nablus. Zakaria Sadeh, field research coordinator for Rabbis for Human Rights, said settlers destroyed 45 trees in al-Leban, al-Sharqiya town, under the watchful eyes of Israeli soldiers. However, according to WAFA correspondence, Israeli soldiers and settlers claimed the land located near 60 Street until Ma'ale Levona was incorporated as a settlement, while Palestinians are now prohibited from cultivating these lands. Welcome to the umpteenth Gorilla Radio X-Mas Special. As we've done in years past so we will again today do; to wit, take a look at where we are this festive time of year, counting our blessings, while wishing the best for those around us, and too forgetting the slights we've suffered, unburdening ourselves the weight of animosities carried throughout the year to live finally life joyous as it is intended to be. This year we'll be joined by: Ini Kamoze, James Carroll, Gil Scott-Heron, Transglobal Underground, Hawksley Workman, Brian Ferry, the Pogues, Sarah Simpson, and maybe even a surprise or two. In January, the Syrian government will – ostensibly - sit across the negotiating table from ‘the Syrian opposition’ to decide on the structure and make-up of a transitional government that promises to end the 5-year Syrian conflict. 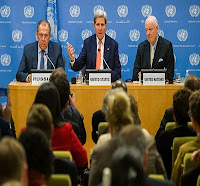 “I want to be clear: the Syrian people will be the validators of this whole effort,” says Kerry again – lest we forget. “Asking the opposition to trust Assad or to accept Assad’s leadership is simply not a reasonable request, and it is literally therefore a non-starter,” explains Kerry from his non-Syrian perspective. To whittle down the ‘Syrian opposition’ to a few dozen individuals that are ‘representative’ of Syrians, several meetings were held to fight it out - mostly in foreign countries. These Riyadh-backed luminaries include ex-SNC President George Sabra, who gained his Syrian ‘legitimacy’ in 2012 from a whopping 28 votes cast by 41 Syrians - in Qatar. They also include Khaled Khoja, who squeaked through as president of the now-rebranded ‘National Coalition for Syrian Revolutionary and Opposition Forces’ with 56 votes out of 109 cast - in Turkey. “The US has neither worked with nor provided any assistance to Ahrar al-Sham. The US supports moderate Syrian opposition groups." Put it this way, if Ahrar were ‘moderates,’ they would have already received direct US assistance, so desperate has Washington been to find Syrian fighters to do their bidding. And influential Americans have worked overtime to whitewash Ahrar - to distance it from Al Qaeda and other extremists, even though Ahrar’s closest primary ground force ally is none other than Jabhat al Nusra. Syria’s largest militant opposition groups are - one and all - financed, armed, trained, supported by the United States, Great Britain, Saudi Arabia, Turkey, Qatar, France and a smattering of other states and nationals. Foreign states that spent five years ignoring the many non-violent Syrian dissidents based in Syria who have spent decades in opposition - in order to manufacture a thoroughly unrepresentative, subservient, malleable and repressive ‘Syrian opposition’ that will serve their interests – should not be rewarded for their deeds in Vienna. Think of Vienna as a stage. Right now, several western powers are seeking a political solution in Vienna as an exit from the Syrian theater - because it has become too costly. The extremism of ISIS, terror threats on the home front, a flood of migrants and refugees, and the promise of indefinite chaos in the Middle East has created a new-found bargaining spirit in the west. For the west, Assad, the Russians and Iranians suddenly look like worthy partners today – able, potentially, to help negotiate a face-saving exit from the Syrian quagmire. It is no coincidence that the US pushed through a nuclear deal with Iran this year – or that Kerry and Russian Foreign Minister Sergei Lavrov are co-chairing the Vienna talks. Finally, acknowledge the reforms that the state tried to implement in the first few months of the Syrian crisis – Syria shut down its military court at the same time that Jordan was establishing a new security court. Why was one derided and the other lauded? Provide the time and space – reconciliation takes time - for Syrians to gear up for new elections under international observation. The name evokes the medieval period that followed the collapse of the Roman Empire, which led to a radical decline in the recorded history of the West for 1000 years. But don’t blame the Visigoths or the Vandals. The culprit is the ephemeral nature of digital recording devices. Remember all the stuff you stored on floppy discs, now lost forever? Over the last 25 years, we’ve seen big 8” floppies replaced by 5.25” medium replaced by little 3.5” floppies, Zip discs and CD-ROMs, external hard drives and now the Cloud — and let’s not forget memory sticks and also-rans like the DAT and Minidisc. I got to thinking about our civilizational priorities the other day, while managing the photos on my iPhone. Few of us realize it, but the default settings of electronic devices like a smartphone is to keep, rather than erase. Take a photo or video, and Apple wants to send it and save it to all the gadgets on your Apple Store account. If you’re like me (and in this respect, most people are), you take lot more photos than you delete. But even your “deleted” stuff isn’t really deleted — it’s merely moved to a “Deleted Photos” folder. And it lives in the Cloud, like, forever. To really really delete something, you have to double-triple-delete it. Most people don’t bother. So all those mundane iPhone photos — countless pics of your kid at the school concert, boarding passes, the image of the wine you mean to get more of — accumulates. Partly due to my failure to edit crap like that, some experts foresee a looming data capacity crisis of epic proportions. A group of fanatic Israeli colonizers hurled, on Tuesday at dawn, several gas bombs into a Palestinian home, in Beitello village, west of the central West Bank city of Ramallah, causing the family to suffocate. The Israeli assailants broke the glass of a window, and threw the gas bombs inside the property, as the family slept, causing them, including an infant, to suffer severe effects of tear gas inhalation. The terrorist attack that targeted the Dawabsha family led to the immediate death of Ali Dawabsha (18-months), while the father, Sa'ad, succumbed to wounds a week after, and the mother, Reham died one month later. Only Ahmad Dawabsha (4) survived the attack, and is still recovering from severe burns. Israeli Navy ships attacked, Tuesday, several Palestinian fishing boats, close to the Gaza City shore, opened fire on them, before kidnapping ten fishers, and confiscated their boats. In another incident, a woman was injured by army fire in Khan Younis. Eyewitnesses said the fishers were in the Sudaniyya Sea area, northwest of Gaza City, when the navy fired several live rounds on them and their boats, and kidnapped ten of them. The kidnapped fishers have been identified as Attaf Aahed Bakr, Soheib Aahed Bakr, Yosri Meqdad, Khaled Bahjat Bakr, Bahjat Khalil Bakr, Shadi Jihad Bakr, Mohammad 'Aahed Bakr, Hasan Zaki Bakr, Mohammad Kamal Bakr, and Mahmoud al-Akhsham, all from the Shaty' refugee camp, west of Gaza city. On Monday at night, Israeli navy ships attacked several Palestinian fishing boats, in the Beit Lahia sea area, in the northern part of the Gaza Strip, and kidnapped four fishers. On Tuesday at noon, the soldiers, stationed on military towers across the border fence, opened fire on Palestinian farmers, east of Khuza’a town, east of Khan Younis in the southern part of the Gaza Strip, wounding one woman, while working in her land. Medical sources said the woman wounded in Khan Younis was moved to a local hospital, suffering a moderate injury. "What did you do at school today, Seamus?" It’s a question I ask him everyday. "Well," my proud preschooler begins, "we did not have a lockdown drill today." And that’s about as far as he gets in the art of storytelling. Sometimes I'll get something about "bim" (gym) or how "Bambi" (Jeremy) pinched him during free play. But the thing that preoccupies my precocious three year old every single day he goes to school is the lockdown drill he and his classmates had in their first month of school. At a parent-teacher conference in November, my husband Patrick and I got a fuller picture of this episode from his teacher. When the lockdown began, she says, Seamus and his classmates were in the hall on their way to the library. Amid the clangs, they sought refuge in the gymnasium closet. Eighteen kids and two teachers sitting crisscross applesauce on its floor amid racks of balls and hula hoops. Seamus, she tells us, sat on her lap with his fingers in his mouth and cried the entire time. "It’s as though nothing else happens at school," my husband replies. "He talks about lockdown drills all the time." Fear? Tell me about it. Unfortunately, I’m so old that I’m not sure I really remember what I felt when, along with millions of other schoolchildren of the 1950s, I ducked and covered like Bert the Turtle, huddling under my desk while sirens howled outside the classroom window. We were, of course, being prepared to protect ourselves from the nuclear obliteration of New York City. But let me tell you, I do remember those desks and they did not exactly instill a sense of confidence in a child. Don’t by the way think that, from personal fallout shelters to fashion tips for the apocalypse, adults weren’t subjected to similar visions of “safety” so hollow as to inspire fear. A government-sponsored civil defense manual of that moment, How to Survive an Atomic Bomb, was typical enough in suggesting that men, in danger of being “caught outdoors in a sudden attack,” should wear wide-brimmed fedoras, which would give them “at least some protection from the ‘heat flash’” of a nuclear explosion. For women, as Paul Boyer pointed out in By the Bomb’s Early Light, his classic book on post-Hiroshima nuclear fallout in American society, “stockings and long-sleeved dresses” were de rigueur for a nuclear event. In those years, I can’t remember a single conversation with my parents about the nuclear drills at school (even though they obviously heard the same sirens), or for that matter about nuclear war. (My best friend, then and now, assures me that his experience was no different.) We lived, my parents and I, in silence through the early years of what might be called the first age of the apocalypse, that moment when the power to destroy all life had fallen from the hands of the gods into distinctly human ones. We still live in such an age. TomDispatch regular Frida Berrigan, far younger than I, had quite a different childhood, as well as parents who couldn’t have answered her nuclear questions more bluntly or graphically, as she explains in this website’s last post of the year. The results, it seems, were no less scary or unnerving than the silence that lay at the heart of what, in my life, could truly be called the “nuclear” family. She informs us that the drills happen about once a month, and that Seamus remains easily startled long after they’re over, running for shelter between an adult's legs whenever he hears loud noises in the classroom. At that moment -- not exactly one of my proudest -- I burst into tears. I just couldn’t square my son’s loving exuberance and confidence in the people around him with the sheer, teeth-hurting terror of children being stalked by an armed killer through the halls of The Friendship School. How, after all, do you practice for the unthinkable? This is a subject that’s been on my mind since I was hardly older than he is now. I look over at him playing contently with his sisters, Madeline, almost two, and Rosena, almost nine, so proud to share his classroom with them. "At home," I tell the teacher through my tears, "we chant 'Gun Control, Not Lockdown Drills!' whenever he talks about them." And then I add, "It makes me so angry that he and his friends have to go through this trauma and the big men get to keep their right to bear assault weapons. He should be scared of lockdown drills. They sound terrible. He shouldn’t have to practice surviving a mass killing episode at one of his favorite places in the whole wide world." I wipe my tears away, but they just keep coming. His teacher is so earnest and so young and I feel so brittle and so extreme as I cry, folded into one of the small seats at a quarter-sized table in her cheerful classroom. "I am sorry," I finally say. "No, no, its okay," she replies with all the kind politeness a teacher learns. "It is hard," she continues, "but this is real. We have to practice for this kind of thing." I wonder, of course. I know that so much of this is based on fears -- not quite irrational but blown out of all proportion -- that have been woven into our American world. 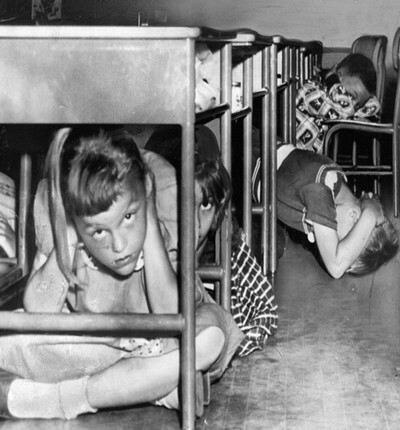 My husband reminds me of how his parents' generation had to practice surviving a nuclear attack by doing "duck and cover" drills under their desks. I was too young to duck and cover, but my parents were ardent anti-nuclear activists with no inhibitions about describing to a child just what such a war would mean so I learned to be terrified of nuclear war at a very young age. I came to believe that the only thing keeping Soviet and American intercontinental ballistic missiles from decimating our cities was the activism, organizing, and witness of my parents and their small band of friends and fellow travelers. We would stand in front of the Pentagon -- this was in the late 1970s and throughout the 1980s -- holding up signs with slogans like "You can't hide from a nuclear bomb" and the old symbol for a fallout shelter printed below it. I was taught that there could be no security, no safety in a world full of nuclear weapons, that the only way to be safe was to get rid of them. Assuming there are more Adam Lanzas out there (and there obviously are), that more gun shops will sell ever more implements of rapid-fire death and destruction, and that more gun lobbyists and promoters will continue to cling to this "God-given, constitutionally enshrined right," my son does need to endure more lockdown drills. The consensus of school security experts is certainly that the massacre at Sandy Hook Elementary School in Newtown, Connecticut (only 80 miles from our house), would have been much worse if the students and teachers hadn't been practicing for exactly the nightmare scenario that struck on December 14, 2012. I wonder now about my childhood fears. They helped me support and believe in the anti-nuclear work of my parents. But nightmares, morbid fascinations with young martyrs, a fixation on the tick-tockings of the Bulletin of the Atomic Scientists’ Doomsday Clock -- these are not things that I want to pass on to the next generation. I guess I’m happy that they don’t know what nuclear weapons are (yet) and it’s one more thing I’m not looking forward to explaining to them. The questions are already coming fast and furious these days and they are only going to multiply. We have to try -- I have to try -- to answer them as best we -- I -- can. It’s a precious facet of parenting, the opportunity to explain, educate about, and even expound upon the wonders and horrors of this world of ours, and it’s a heavy responsibility. Who wants to explain the hard stuff? But if we don’t, others surely will. In these early years, our kids turn to us first, but if we can’t or won’t answer their questions, how long will they keep asking them? Somehow, and I can’t tell you quite why, this seems to me almost worse than the truth. At Seamus' school, they don't talk explicitly about an armed intruder, but they do make a distinction between fire drills where they evacuate the building and "keeping safe from a threat" by "hiding" in it. In the month since our parent-teacher meeting, Seamus has endured another lockdown drill and our country has continued to experience mass shooting events -- San Bernardino and Colorado Springs being just the most horrific. While at breakfast, Patrick and I read the news about healthcare offices and social service agencies turned into abattoirs, and yet we speak about such things only in code over granola and yogurt. It’s as if we have an unspoken agreement not to delve into this epidemic of gun violence and mass shootings with our kids. After the police killings of Lashano Gilbert (tased to death in our town of New London, Connecticut), Eric Garner, Michael Brown, and Freddie Gray, we took the kids to candlelight vigils and demonstrations, doing our best to answer all Seamus's questions. "Why do the police kill people?" followed, of course, by "Are they going to kill me?" Then we somehow had to explain white privilege to a three year old and how the very things that we encouraged in him -- curiosity, openness, questioning authority -- were the things black parents were forced to discourage in their sons to keep them from getting killed by police. And then, of course, came the next inevitable "Why?" (the same one I’m sure we’ll hear for years to come). And soon enough, we were trying desperately to untangle ourselves from the essentially unintelligible -- for such a young child certainly, but possibly the rest of us as well -- when it came to the legacy of slavery and racism and state violence in explaining to our little white boy why he doesn't need to cry every time he sees a police officer. And then came the next "Why?" and who wouldn’t think sooner or later that the real answer to all of his whys (and our own) is simply, “Because it’s nuts! And we’re nuts!” I mean, really, where have we ended up when our answer to him is, in essence: "Don't worry, you're white!" And then, of course, there’s the anxiety I have about how he’ll take in any of this and how he might talk about it in his racially diverse classroom -- the ridiculous game of "telephone" that he could play with all the new words and fragments of concepts rattling around in his brain. Good luck on that these days, but sometimes I do wish the same for myself. No news, sit tight, and pretend nothing’s going on. After all, like so many of our present American fears, the fear that my kids are going to be gunned down in their classrooms is pretty irrational, right? Such school shootings don’t exactly happen often. Just because one did occur relatively near here three years ago doesn't mean pre-schools and elementary schools are systematically under attack, yes? Why is the sky blue? I have no idea, but it takes only a minute of Googling to find out that it has something to do with the way air molecules scatter more blue light than red light. Why do people die? Because no one can live forever, because they get sick and their bodies get old and their organs don't work any more and then we cry because we miss them and love them, but they live on, at least until our own memories go. Why does grass grow? Well, Google it yourself. The problem, however, is with the most human of questions, the ones that defy Googling and good sense -- or any sense we may have of the goodness of humanity. And maybe, kids, we just have to wrestle together with those as best we can in this truly confusing world.